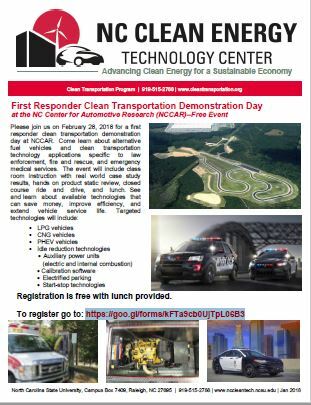 Please join us on February 28, 2018 for a first responder clean transportation demonstration day at the NC Center for Automotive Research (NCCAR). Come learn about alternative fuel vehicles and clean transportation technology applications specific to law enforcement, fire and rescue, and emergency medical services. The event will include class room instruction with real world case study results, hands on product static review, closed course ride and drive, and lunch. See and learn about available technologies that can save money, improve efficiency, and extend vehicle service life. Registration is free with lunch provided. Register NOW! Classroom session will be for background and testimonial/case study presentations on technologies. Ten minutes per technology including testimonial/case study. Learning sessions will follow in the same class room. After lunch there will be technology static review and demonstrations, along with vehicle test drives on a closed test track. Recruitment for the event will be targeted at law enforcement; fire and rescue, and emergency medical services personnel; fleet managers; and government officials involved in procurement decisions for vehicles and equipment in NC, VA, SC, VW, TN, KY and DC. We will seek cooperation from professional organizations such as NC DOI OSFM, IFMA, NC SFA, NFPA, NCACP, NCSPA, NCLEOA, NCREMS, NCAEMSA, IAFC, and counterparts in other states for event recruitment. In addition, we will advertise to NC Clean Energy Technology Center lists, as well as seek support from the Clean Cities Coalitions in NC, VA, SC, WV, TN, KY and DC, as well as NAFTC at UWV. Note: Agenda and featured technologies are subject to change. Designed to exacting standards, the NCCAR is an independent, non-profit center devised to meet the ever-evolving product research, testing, and development demands of the automotive industry. State sponsorship and affiliation with North Carolina’s university and community college system offers exceptional opportunities for matching the innovative talents of the world’s automotive industry with the research capacity and business development resources of the State of North Carolina. On the 620-acre site, NCCAR is home to a two-mile bi-directional road course, a two-acre vehicle dynamics area, a seven-acre dirt facility, and three-mile dirt trails for trucks or side by sides, and six-plus miles of ATV and dirt bike trails. In addition, the NCCAR facility offers multiple conference rooms and client suites, fully equipped with tools and technologies.